Cockapoo | Can Men Cook? Three Ducks and you’re out! We had duck three times in a day and a half. Let me explain. Duck and Hoi Sin wraps from M&S while travelling to Liverpool. That was the first duck. This was our last Christmas adventure (a motorway Christmas…). We were visiting friends in Formby, Merseyside. She did sound calm. We slowed down and left them to the panic. I am sure we have all done this at some point in our lives. As receivers of the news, or as givers. It was astonishing – we arrived 40 minutes later (amazing how slowly one can go if you put your mind to it) and you just would not know that we were 7 days and 30 minutes early. Welcomed with open arms, apologies all round (no blame…) and G&T in hand within 3 minutes. There had been a mad 30 minutes that was completely indiscernible, but we were truly embarrassed. There was a lot of dog fuss to contend with. Our friends had recently lost their eldest dog – Molly, who was only 4 and a bit, so desperately unfair to have such an aggressive cancer. She was lovely. 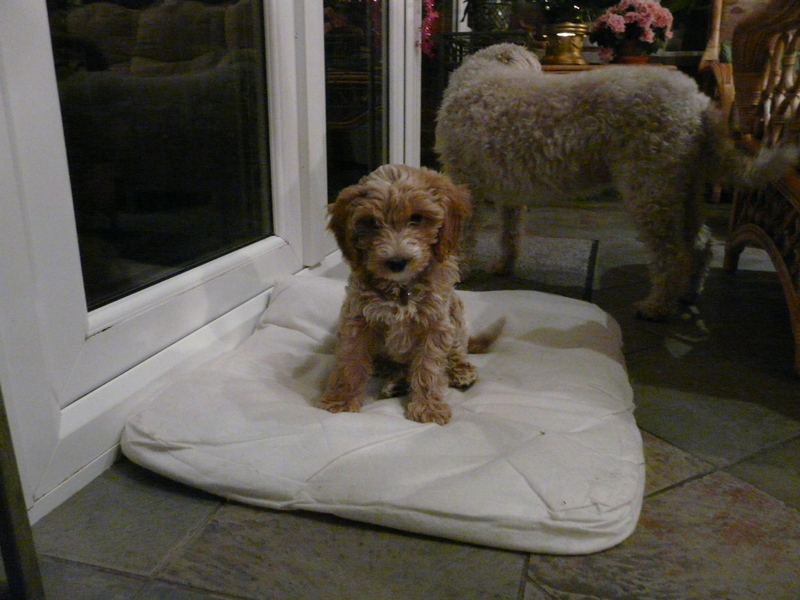 Their other dog, Flossie was now the adult (having been the playful puppy in the hierarchy up to recently , and the new addition is a cockapoo – cross between a poodle and cocker spaniel. Maisie is only 10 and a half weeks old, but already feels pretty adult in outlook (apart from the usual puppy incontinence). A second duck had been purchased from Waitrose, and was ready about an hour later. It was amazing, really. And Tony makes the worlds best roast potatoes. It was a feast of fine proportions. Cheese (Tony’s choice) and Bakewell tart (the rest of us) filled us to overflowing. As did the wines, whisky and quite different and unusual Ginger Liqueur. A splendid evening. We followed this with a Chinese banquet at my sisters for her birthday. All bought in, and centre stage was the worlds most enticing starter – crispy duck pancakes! As ever, we had ordered a little too much – not excessive but we were all pretty full. M&S do make it really easy, don’t they? It does feel so simple that I am sure they have made huge in-roads into the Chinese take away market? Celebrations all round. It didn’t feel like duck had dominated – although it does read so. I think I could get used to that level of duck-ness anyway – they were all very different (and had lots of other things alongside them) to feel like quite different experiences anyway. So final apologies to our friends , Happy Birthday to my sister (and we had great Christmas presents too – one of which was Larousse Gastronomique – more later) – and a Happy New Year to all, once more!